When I opened your page up from my google reader, I totally wasn't expecting to see this cute pup wearing heart shaped glasses. This is the best thing I've seen all day! Totally cute!! --Happy Valentine's Day!! Too cute! My kitty was my Valentine! Wow, that is Star Power! Not everybody could pull off those glasses and look so cool! Schatze is the name of the dog my aunt and uncle had when I was really little --- their Schatze never wore sunglasses though! And how did you get your Schatze to wear those glasses anyway, Mary? 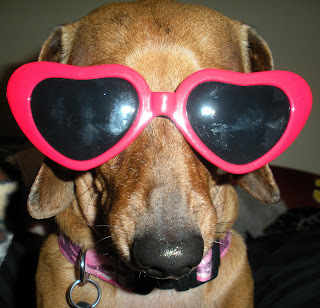 Schatze had the help of a rubber band around her collar to keep the glasses in place!